To make these potatoes, you simmer peeled and sliced russet potatoes until tender, and then mash them and mix in milk, sour cream, butter, a bit of Dijon mustard, garlic, cayenne, and salt and pepper. To make the topping, you process good quality bread in a food processor to create bread crumbs. Next you toss the bread crumbs in melted butter and then toast them in a 300 degree F oven. Oh yes... the cheese. 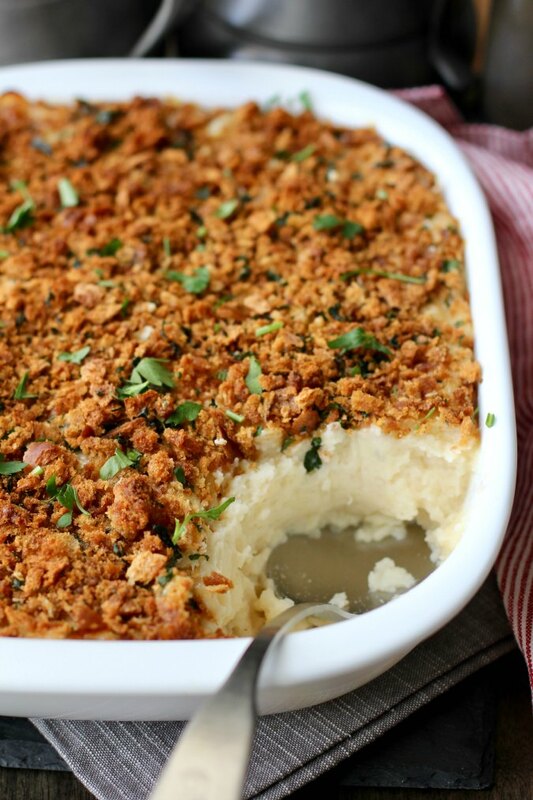 Once you mix the potatoes and spread them on your casserole dish, you sprinkle the top with lots of extra sharp cheddar cheese before adding the bread crumb topping. I used white cheddar in this dish, but yellow cheddar cheese would be just fine. In fact, you could use Monterey Jack cheese, or, if you want to get really fancy, gruyère cheese would be really nice. If you want to get decadent, you could add minced fried bacon and/or caramelized onions to the cheese mixture. When it comes to Thanksgiving or holiday dinners, I'm always looking for ways to make as many courses as possible in advance. I haven't quite perfected making the entire meal in advance, but I'm definitely getting closer. My latest is this make-ahead turkey gravy. It's definitely a stress reducer. 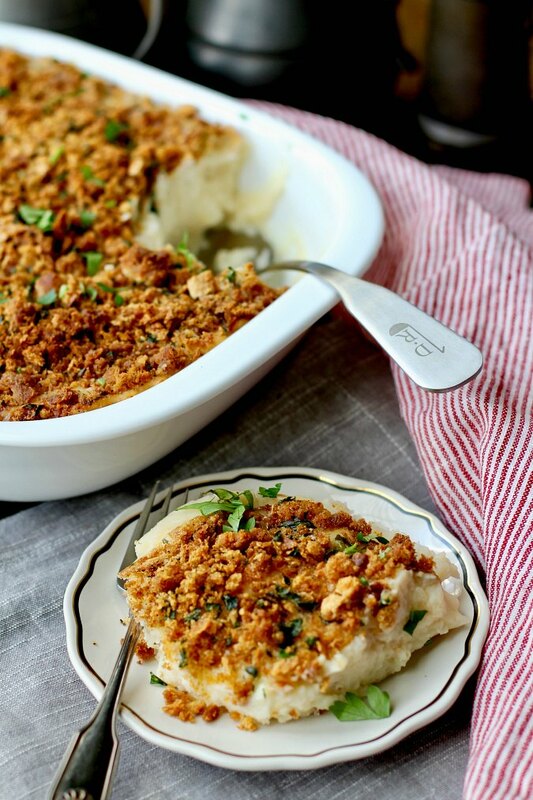 By the way, this recipe will give you enough mashed potatoes for about 16 servings as part of a multi-course meal... plenty for your guests, and plenty for leftovers. Do You Have More Make-Ahead Holiday Dishes? Make-ahead buttermilk dinner rolls - so soft and fluffy, and you can make them in advance, refrigerate the shaped rolls, and bake them right before dinner. Make-ahead potato semolina rolls - another great dinner roll that you can shape, refrigerate, and bake at the last minute. 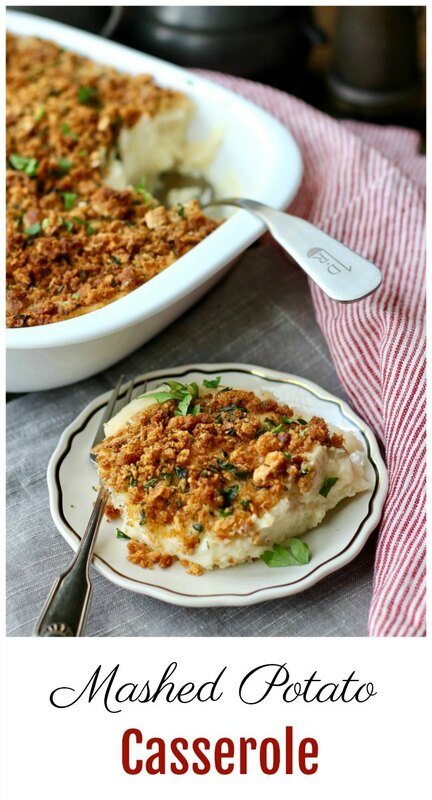 Make-ahead mashed potatoes - another great recipe for holiday potatoes. Ruby port cranberry sauce - there's nothing like homemade cranberry sauce. Of course, most desserts can be made in advance. I'm going to keep working on my cooking skills, especially when it comes to pulling off dinner for a crowd. I recently purchased Ina Garten's Cook Like a Pro, which is loaded with tips and tricks from her days as a caterer. You'll need lots of sides for your holiday dinner. I've joined up with some food blogger friends to bring you lots of recipes for holiday side dishes to get inspired and ready for the holidays. This get together was arranged by Heather of Hezzi-D's Books and Cooks. Heat your oven to 300 degrees F. Pulse the bread in a mini food processor a few times, until the bread forms coarse crumbs, about 6 pulses. Toss the bread with the butter and spread it out over a half-sheet pan (rimmed baking sheet) and bake for about 20 minutes, stirring occasionally. Let cool and then toss with the parsley, salt, and pepper. Set aside, along with the cheese, to top the casserole. Place the potato slices in a large sauce pan and cover with water. Bring to a boil, and and then reduce to a simmer. Cook until the potatoes are tender, about 15 minutes. Drain the potatoes and then run them through a food mill or potato ricer and add them back into the saucepan. Add the milk, sour cream, butter, mustard, garlic, and cayenne and stir. Add salt and pepper to taste. Spread the potato mixture over a 9 inch by 13 inch casserole. Sprinkle the potatoes with the grated cheddar cheese, and then the bread crumb mixture. Cover the dish with plastic wrap and refrigerate up to 2 days in advance. When ready to bake, remove the plastic wrap, and cover the dish with foil. Heat the oven to 350 degrees F. Bake the covered dish for 20 minutes. Remove the foil and continue to bake for 20 to 40 minutes more, until heated through. Depending on your dish, baking times will vary. Use an instant read thermometer to test the casserole for doneness. This sounds so incredibly comforting! The garlic and parsley combo in mashed potatoes is amazing isn't it? We will try this one out in the Holiday season, pinned! Excellent recipe dear Karen!